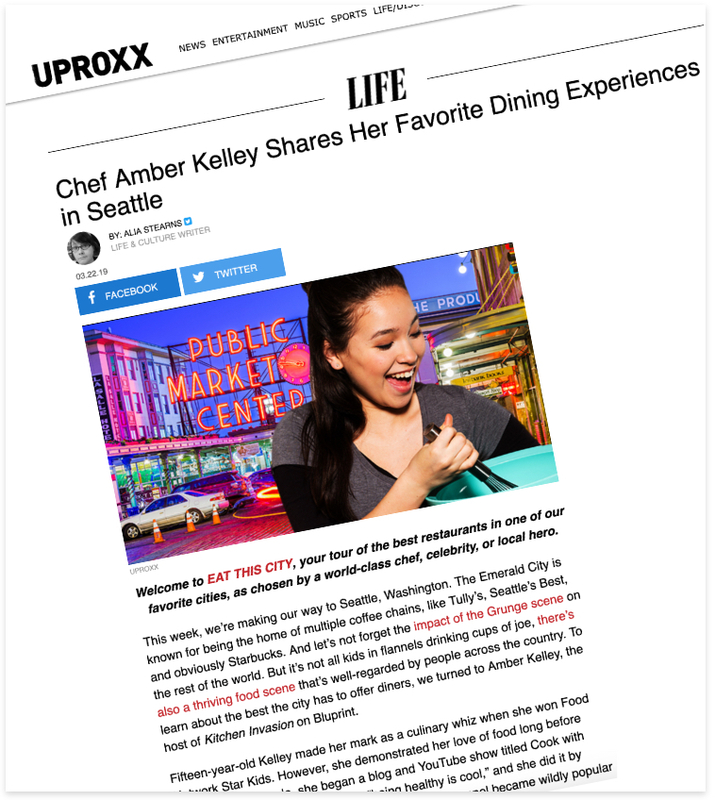 UPROXX – My Favorite Dining Experiences in Seattle! Want to know where to get the best slice of pizza in Seattle? Check out my list of some of my favorite places to eat in Seattle on UPROXX. Did any of your favorites make the list? Seattle isn’t known for pizza, but it might be if Pagliacci Pizza ever goes nationwide! This pizzeria started in the University District, but has locations throughout the greater Seattle area. The crust is the perfect hand-tossed thin crust, and while they have lots of different types of pizza with different sauces, their seasoned tomato sauce is my favorite. We get their original cheese, pepperoni, and my dad likes the Brooklyn Bridge – which is the ultimate meat and veggie combo – and it’s all amazing. When I’m trying to avoid dairy (to control my acne – ugh) they’ll make me one without cheese and it’s still delicious! Try it with their fresh and hearty Pagliaccio Salad – which I always eat multiple servings of – and you’ll be stuffed for days. There are lots of great Asian restaurants in the Seattle area, but my favorite is Din Tai Fung. It’s especially a great place for kids, because you can see the chefs making the small packages of dumplings while you wait…and they are SO good at what they do! When we were younger, my sister and I would just sit and watch them make dumpling after dumpling…I imagine my parents liked that we weren’t complaining about the wait, which is usually really long! One of the best things there, and what they are known for, is their soup dumplings. They are tiny little dumplings with a meat filling (we like pork) and broth inside. You tear it open just a bit, drink the soup, then dip the dumpling in the ginger-soy sauce and eat. It is SO GOOD. I promise you’ll end up ordering another! Pike Place Market is a Seattle’s original farmer’s market, and a must-see for all of our friends from out of town. Whenever we go, we stop by Pike Place Chowder, which always has a line around the block. The line is for a good reason – they have a large selection of chowders that are sure to please everyone. I’m a bit boring and always get the New England Clam Chowder, but my family and friends have let me taste others, like their Seafood Bisque and Market Chowder, which includes ingredients chosen by the chef that day. They are ALL delicious! The biggest challenge is to find a ledge somewhere on the street to sit to eat your chowder, which always comes with soft slices of sourdough bread…but I guess that’s part of the fun. The dessert on my mind for the last 6 months is “Jar of Pie” at Heritage Restaurant and Bar. It’s the most adorable presentation – in a little mason jar, you have key lime curd, buttered graham crackers, and toasted marshmallow. Yes, it’s as good as it sounds – tangy and creamy, it melts in your mouth. And so so pretty. I end up eating tiny little bites to savor every little bit. Heritage has amazing food too – the Caramelized Sea Scallops with mushrooms are ah-mazing. Heritage itself is in the heart of Woodinville, a suburb of Seattle known for having many wine tasting rooms. I don’t go wine tasting, obviously, but I’ll go to Heritage any time. My all-time favorite fine dining restaurant is the Barking Frog. They serve my favorite food ever – Grand Marnier Prawns! The plump, sweet prawns are coated in a creamy, orange sauce that is tangy, sweet, and savory. It’s an appetizer portion so we only get a few shrimp – so I once asked my parents if I could have 10 plates of if I could get straight A’s in school. That was a few years ago, and I’m still working on it!  It’s a real crowd favorite and so the recipe has been featured by the local news, magazines, and books – google it and you’ll find it online! We’ve tried making it at home but I have to say it’s just not as good as the original at the Barking Frog. The restaurant itself is beautiful, with a huge round fire pit in the middle of the room. My uncle works there as a pastry chef and makes the most creative, beautiful desserts – so don’t go there without ordering dessert! We have been to Just Poke at least 5 times in the last two months or so, because it’s the perfect meal after a long day of volleyball games. It’s so fresh, flavorful, healthy, and so convenient! You get to choose your favorite delicious, sustainable, sushi-grade fish, sauce, and all sorts of toppings over sushi rice, mixed greens, or zucchini noodles. These bowls are colorful, delicious, and well – always perfect because you get to choose all the ingredients that go into it. My favorite is tuna and salmon mixed with Spicy Aioli and House Shoyu, served over sushi rice, topped with seaweed salad, cucumber, and crab salad. There are a million combinations, and you can never go wrong. I went there two nights ago, and I’m already ready to go back! My friends introduced me to Evergreens, and I fell in love instantly. It’s a feel-good fast food, and SO. GOOD. They serve salads, wraps, and grain bowls, and you can have them build one of their signature combos, or create your own. They take all the fresh ingredients and assemble it for you right there. It’s a perfect meal in the summer, and I love to go to their University Village location with my friends after some shopping. My favorite combo is a bed of romaine topped with crunchy cucumbers, carrots, red onion, juicy tomatoes, and spicy pepperoncini…with ranch dressing drizzled all over. I don’t know why, but Mother’s Day seems to be the most popular day to have brunch. The past several Mother’s Days, we’ve chosen to go to Ivar’s Salmon House near Gas Works Park in Seattle. Ivar’s is a real Seattle icon, and they are known for their seafood and chowder. They have several locations, but the Salmon House has a gorgeous view of Lake Union, and the restaurant itself shows off Native American art and architecture. The brunch is an endless option of dishes, from oysters on the half shell, crab, lox, and salmon. Of course, they have all the traditional items, including omelet bar, French toast, Eggs Benedict, and let’s not forget the dessert bar! We go as a big crowd and no one is disappointed! Most folks might think I’d choose salmon to be Seattle’s iconic food, but that’s just too easy. I’m choosing to tell you about Chukar Cherries because they are less-known outside of Seattle, but they really are home-grown, and respected around here. They started in Prosser, a small town in eastern Washington that I visit often because we have family friends there – and started a whole business around a Washington staple – cherries. They started with dried cherries, but now have all sorts of delicious treats, like gourmet chocolate-covered dried cherries, nuts, and snacks. They have a booth at Seattle’s famous Pike Place Market, and I see their products in stores everywhere – so you don’t have to go to Prosser! My favorite are the Honey Pecans – caramelized pecans coated with milk chocolate, then dusted with powdered sugar. YUM! When I launched my cookbook last fall, one of the places we did a book signing is the FrogLegs Culinary Academy in Seattle. They have an adorable storefront full of fun kitchen items and toys, and a beautiful kitchen in the back for cooking classes. What I didn’t know when I first went there, is that they sell edible cookie dough! We met their recipe developer, who created a whole bunch of amazing flavors that are perfectly safe to eat because it doesn’t contain raw egg. I got the traditional chocolate chip – and it was delicious! My parents had heard about Deru Market and their famous cake for years and when we finally got some ourselves, we were hooked! It is dense, creamy, and oh-so-delicious. We love the dark chocolate cake, the vanilla cake with chocolate frosting, and their carrot cake is the best we’ve ever tasted! The slices are HUGE, so we usually have 2 pieces for the family and savor every bite. It seems that if anyone in our family has a birthday, Deru cake is on the menu! If you go to their cafe, you’ll see all the cakes on display – but be sure to get there early, as many flavors sell out before the day is done. I don’t know what it’s like to have a real hangover, but I’ve certainly had a sugar hangover, and the acai bowl and raw juices at HB Beverage Company are the perfect cure. HB stands for “healthy bones” and healthy never tasted so decadent! I love their Acai Bowl, filled with berries, pineapple, banana, and crunchy granola, but I also love their Nut-Buster, which is their banana “nice cream” with peanut butter, peanuts, and pretzel. We also always pick up a 4-pack of their “U Got Kale” juice, which is the perfect green juice when you don’t have time to make it at home, and the easiest way to get those greens when you need a pick-me-up. Bonus: Where Can You Find the Best Meatless Meal? When I was filming Food Network Star Kids, the mom of another kid chef on the show told us that the best Israeli food in the Los Angeles Area is Hummus Bar & Grill (and she is Israeli!) She mentioned this because it was right across the street where we were filming – and during the lunch break, she went and got several dishes for us to try, including pine nut hummus, falafel, and the fluffiest, softest pita bread I had ever eaten. She explained to us why it’s so good – like how the falafel was bright green when you break it open, showing it uses lots of fresh herbs. That was it! I had found my favorite restaurant. Since then, I’ve been to LA many times, and every time I go, we go to Hummus Bar. It’s a must. We always order the same things I tried that day while filming – the creamy, nutty pine nut hummus, flavor-packed falafel, and pillowy pita bread. And I love it just as much each time.